To help you with the creation of your new driving school website, we have created a gallery of useful links and also provided the most popular driving school logos in crisp graphical quality for internet display. Creating links to external websites, finding logo pictures and L plates (red or yellow) at the right image size and quality and getting the correct website URLs can take a considerable amount of your time. 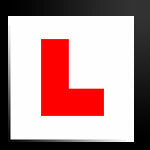 Save time and money by visiting the driving school logo selection on this driving instructor website. If you would like to feature your website on our FREE driving school links directory, please contact us and submit your website.